No one had guess correctly my final destination. I thought it would have been easy but then maybe there were a red herring that threw people off. 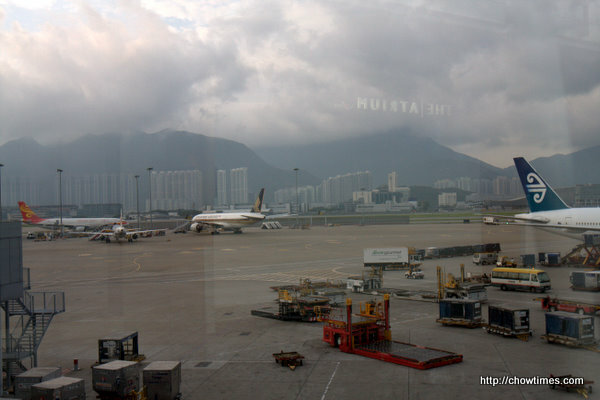 The red herring I am talking about is the Hong Kong International Airport. 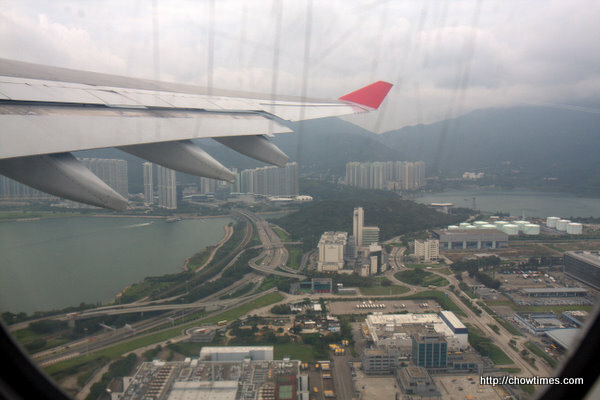 Above is the view from the plane of the new airport in HK. It would have been more exciting flying in and out of the old Kai Tak airport. I remember being able to peer into people’s apartment in the city from the plane and thinking if the plane I was in will be the first to crash into the middle of the city. Choi. Touch wood – touch wood. Hehehe … knew you guys will try to guess where I was going to. Very interesting guesses! The 13 hour flight was not too bad. I was so dead tired, I slept pretty much all the way there. Love the flight. Cathay Pacific (along with Singapore Airlines) is one of the best airlines according to my books. I like their new entertainment system where they have 100 movies on demand. I managed to watch The King’s Speech, a show I missed when it was showing in the theatres. Then I watched 10 minutes of three other movies … fell asleep after just 10 minutes. In a way it is good I could sleep and so time passes faster. 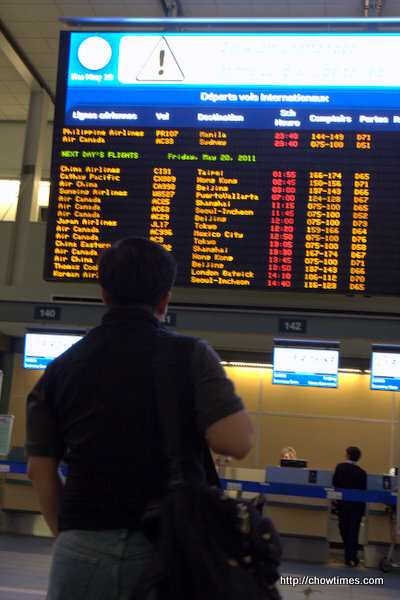 The flight landed at just after 6:30 AM in the morning. Can you guess where this airport is? Tall mountains in the background with super tall apartment buildings too. Oh boy. Am totally drained right now. Just managed time to get some breather before things ramp up again. And this is exciting times for me. The order came down just 40 hours prior. All the instructions I had was summed up in a 10 minute phone call and a couple of documents to review. I am given two days to make my way half way around the world to take on a new project. So I had less than 2 days really to get all the paperwork ready, the travel arrangements, and multiple phone calls to gather as much information I can. That doesn’t give me much time. For every piece of info I got, spawns more questions. Oh well, I’ll just have to deal with the what, why, who, how and when along the way. I slept about 5 and 2 hours the last 40 hours. So I am mentally and physically drained right now. I will have time to catch up on the much needed sleep on the long flight ahead. I just love the job! All the adrenalin rush are just the sort of stuff that gets me all motivated. It’s been a while since Polly and I had a real cake meet. I meant cake and dessert. We had been exploring other options lately like ramen lunch at Ramen Sanpachi on Broadway and English breakfast at The Diner at West Point Grey. 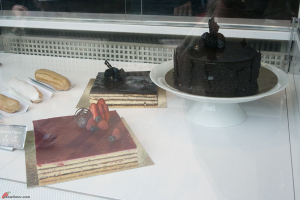 For this cake meet, we decided to go to Faubourg, a French bistro. 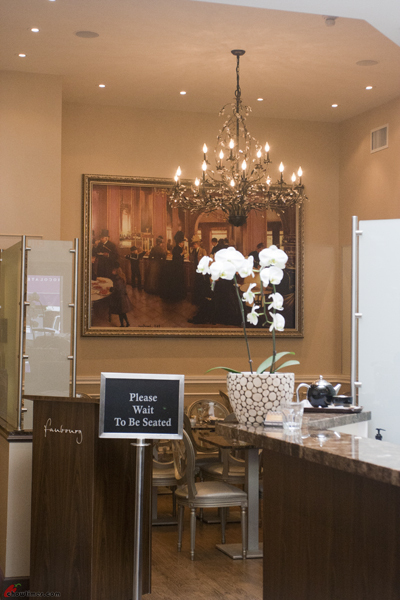 We attempted to visit Faubourg some time ago without the proper address and ended up at Simply French. This time we make sure we have the address. 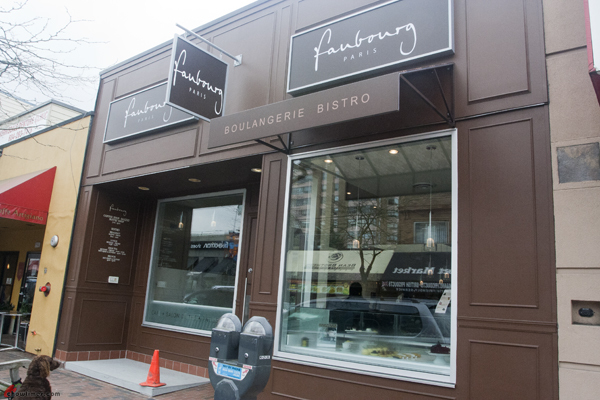 Faubourg is located on West 41st, west of West Bvld. Meter parking is available along W 41st. 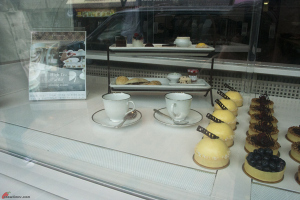 The front of Faubourg has a display of some of their cakes, pastries and Viennoiserie. 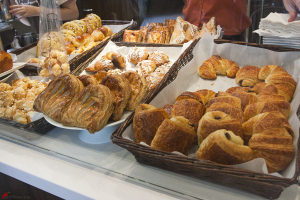 Viennoiserie is sweet pastries like croisssant, pain au chocolat, brioche, small roll, etc. 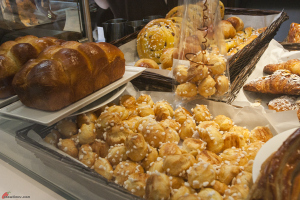 The name Viennoiserie evolved from the long-held myth that they originated in Vienna rather than France. I had an eye on the chocolate cake but unfortunately, it’s not available at the time we were there. 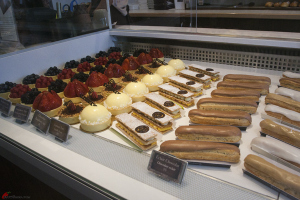 Faubourg is divided into 2 sections, the coffee shop and the bistro. We sat at the coffee shop area. From where I sat, I had a direct view of the bistro area. The bistro is a segregated area with high-ceilinged space, bedecked in hardwood floors, marble-topped tables and fanciful chairs imported from France. I guess if we were seated at the bistro area, we’ll have to pay for the table service with a big tip. I’m very impressed at the way they prep the bistro area because I saw them actually wiping down the legs of chairs and tables. The coffee shop area is self service i.e. 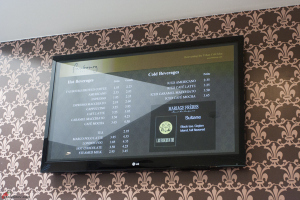 you order your drink and pastries and pay at the counter and bring your food to a table. The coffee shop area seats about 25. I have a new project and Suanne hates me for it. It is called the “Japanese Cuisinization of Suanne”. I had been pushing her to give raw fish a try. I roped in Arkensen and Nanzaro to put collective pressure on her. Each time she just coolly tell us “I just don’t like raw fish”. End of story. Actually it was not that hard to break Suanne down. She is simply just too sweet and will do anything for her boys at home. My point of attack is Chirashi. It is something that was just milling around my mind over and over again. I had never tried it before and I wanted to try it. I wanted to try it WITH Suanne. When I asked on Facebook and Tweeter a good place for Chirashi, back came a number of suggestions. One of them was Gyo-O. I like that name. I think it is pronounced as “Ghee-Yoh-Oh”. Is that correct? Whatever it is I will call it “Ghee-Yoh-Oh”. Anyway, when I declared that we are having Japanese and we are driving outside of Richmond AND that mummy is going to try raw fish dish, the boys let out a cheer and gave me high fives. Suanne on the other hand refused to even look at me as she muttered “OK”. 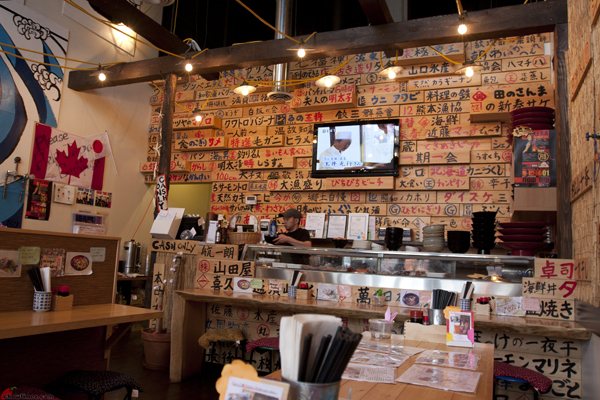 Gyo-O is part of the Gyoza King group which operates several excellent Japanese restaurants. 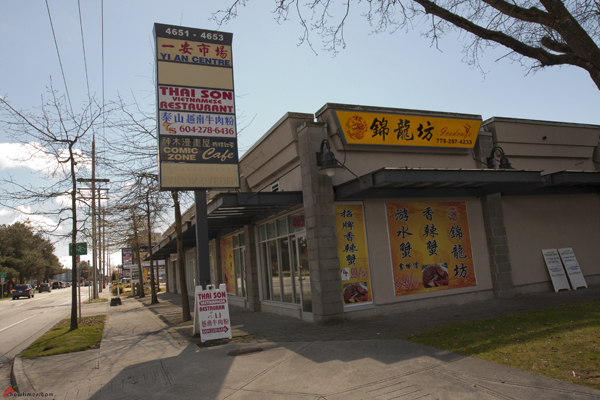 Among them includes Nanchuu on Alexandra Rd, Richmond and G-Men Ramen just across the parking lot from Gyo-O. They use to also have their name on a food cart in Richmond called Grazy-Dog but I don’t see them around anymore. 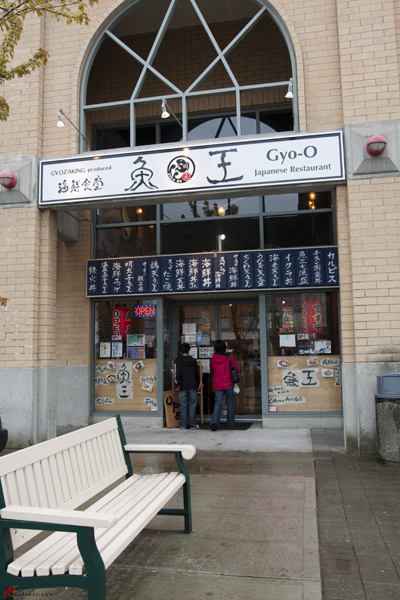 Gyo-O is located on the Continental strip mall on Sexsmith and Cambie. The walls had this wooden panels with Japanese words on them. It was all over the restaurant. I have no idea what they were but if you ask me to guess, they could be their menu. The service is very Japanese. Very courteous. I had never been to a Japanese restaurant where we had poor service before. Have you ever encountered bad service in a Japanese restaurant before? It is just how the Japanese people are and how this is all ingrained deeply in their culture. The Argo Cafe is certainly a place I would not have found on my own. It was HM who alerted us about this hidden gem. After doing a bit of research on line, it appears that it is very well known and popular with people who works around the area. 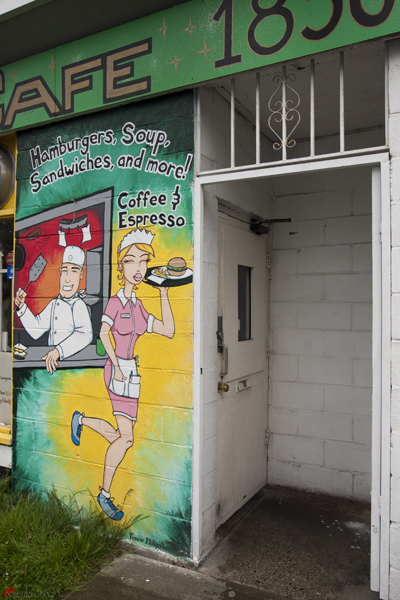 The Argo Cafe is perhaps one of those place you will not bother check out. At a quick glance, you might not even think it is a restaurant. The painting outside is very gaudy. There is the heavy metal door and the windows are barred. If I did not know anything about this restaurant, I don’t think I would even go in for a cup of coffee. Driving along Garden City about two weeks ago, I noticed a sign outside a quiet strip mall. It was bright yellow and all the Chinese. I knew this place used to be a really quiet bubble tea house called Iced Cafe. We never bothered visiting Iced Cafe because we were not really that much interested in bubble tea and stuff. The moment I saw that I swung into the carpark to have a closer look. I like checking out new restaurants. It was this sign that caught my eyes. 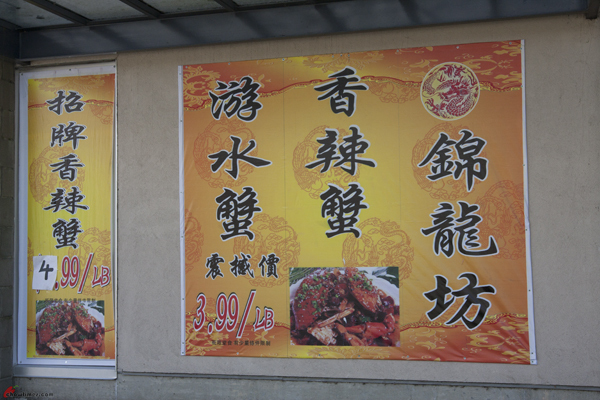 I can’t really read Chinese but I sure can read $4.99/lb … and that price was over the picture of a crab dish. That was ridiculously low, I thought. I am not sure if you could even buy frozen crabs at this price from the supermarket, let alone have it cooked and served in a restaurant. I know. This is not exactly the healthiest of breakfast. When I was young and growing up in Malaysia, I used to always walk to the open air wet market near my house to buy breakfast. There are a lot of choices but there is one thing I like to buy most of the time is the curry with pork skin. I like it so much that in my last trip back to Malaysia a few years ago, the first place I headed to for breakfast is exactly that. For some reason, back home in Vancouver, I completely forgot about it. The reason was because I did not come across pork skins until now. So with the help of Suanne, I made the pork skin in laksa broth above. Maybe the proper word to describe this is not made, but rather assembled. For those of you who love laksa and pork skin, this will be something you will like a lot. I am sure. 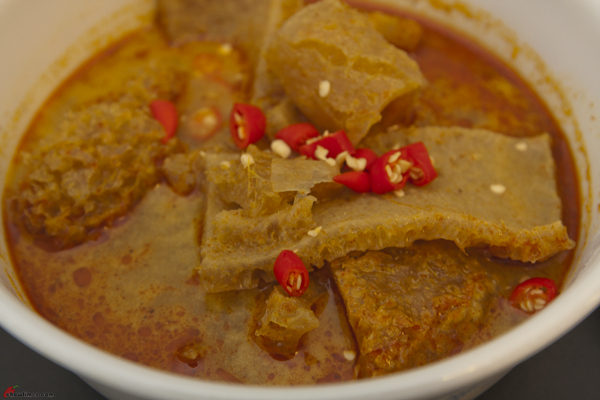 The pork skin does a great job in absorbing and holding the laksa making it bursting with flavour. There are not many places where you can buy pork skins like these above. Or at least I have not paid much attention to it until recently. What really excites me is that it is really cheap. It is just $2.99 a pound. Not knowing how much is a pound, I told the shop that I wanted $5.00 and they ended up giving me $7.00 worth of it. That makes it well over 2 pounds. Actually it is not really what it is weigh because it also holds some clear jhup which I figure makes up the bulk of the weight. The owner of the shop told me that not many places will “bow” (translated as explode in English), these pork skin but they do make it themselves. 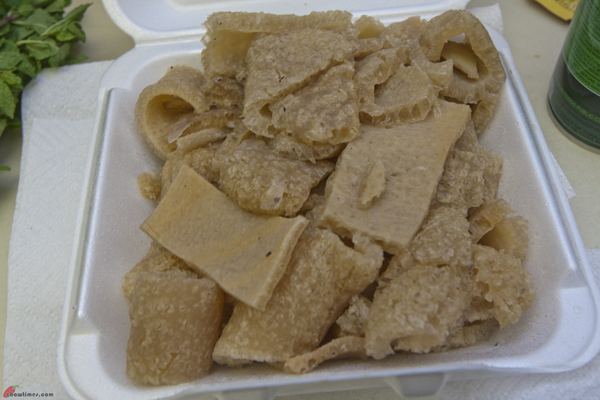 I am wondering if any of you knows of other places who also “bow” pork skins in Vancouver. 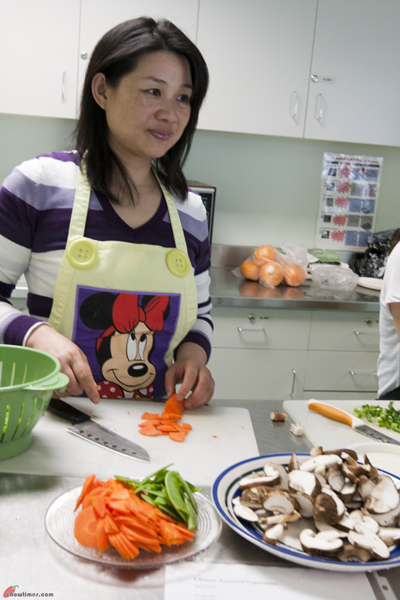 Joanna decided to demonstrate a Chinese Assorted Vegetable Stir Fry at the Caring Place Community Kitchen when approached by Minoo. She told us that she just watched this stir fry recipe on the TV and want to put it to practice. Joanna had demonstrated Fried Magu Rice Vermicelli in this kitchen earlier. 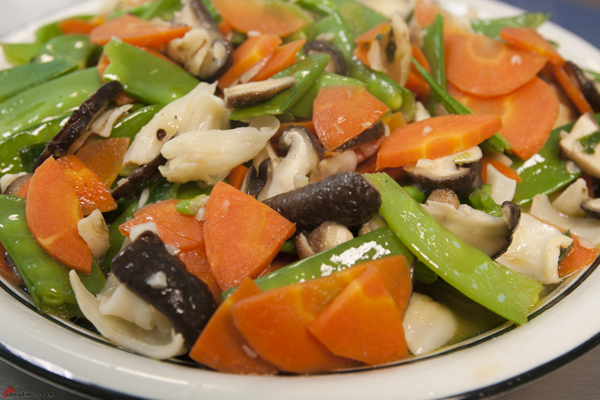 This Chinese Assorted Vegetable Stir Fry is a vegetarian dish. Joanna got the inspiration from another TV show to add lily bulb into the stir fry. If you use dried shiitake mushroom, you will need to reconstituted in warm water for 2 hours. 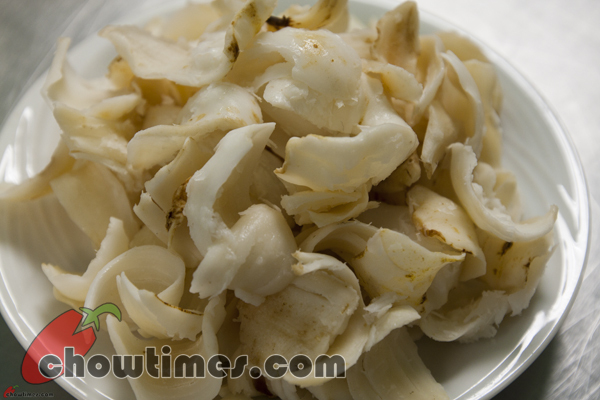 Dry lily bulb can be bought from Chinese herbal or groceries stores. Fresh lily bulb is also available from Chinese groceries stores. Lily bulb looks like garlic and the bulb is made with layers that resemble onion. It is a crunchy texture. According to Joanna, lily bulb is good for the skin, cancer control and prevent inflammation. From my earlier post on Ching Po Leung, lily bulb benefit includes moisten the lung, cooling the body, stop cough and sore throat, lower fever, etc. Joanna came from the province of Jiang Xi, China. Joanna told us her province has beautiful mountains. Her village has a small river but the people there do not like picnic at the river because there is no facilities like picnic table and toilet. The villagers have rice fields and raise their own chicken, grow their own vegetables and fishing for food. She said the life there is hard as there is not enough food. When asked if she misses her hometown, she said she usually feels homesick during Chinese festivals like Chinese New Year, Ching Ming, Dragon Boat Festival and Moon Cake Festival. 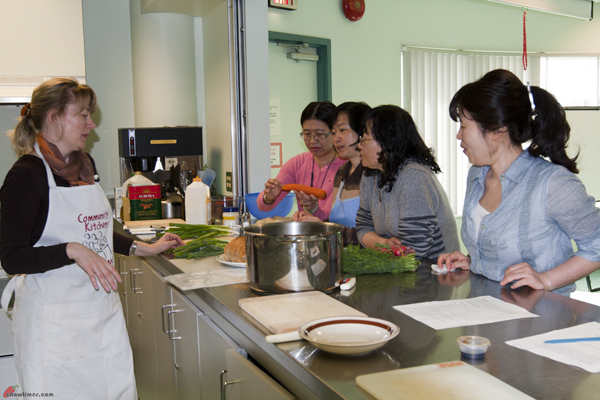 Iryna and Joanne partnered up to demonstrate at the Caring Place Community Kitchen. Iryna is from Ukraine. She demonstrated a very popular Ukrainian dish which originated from Russia. It is a cold soup dish called Okroshka. Iryna told us that she had been making this cold soup all her life. She served the Okroshka with toasted bread and a dollop of sour cream. 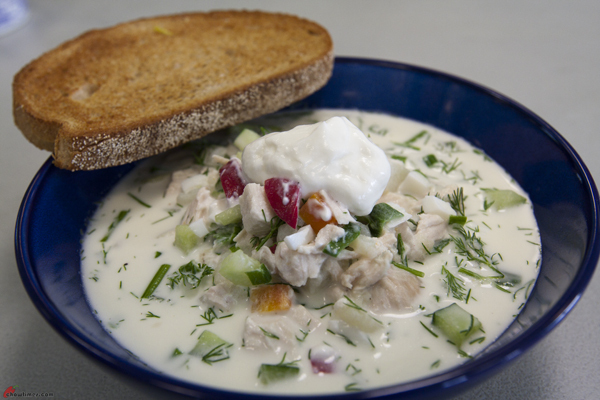 Okroshka is a summer dish. It is a very refreshing soup. It is made with fresh diced vegetables. 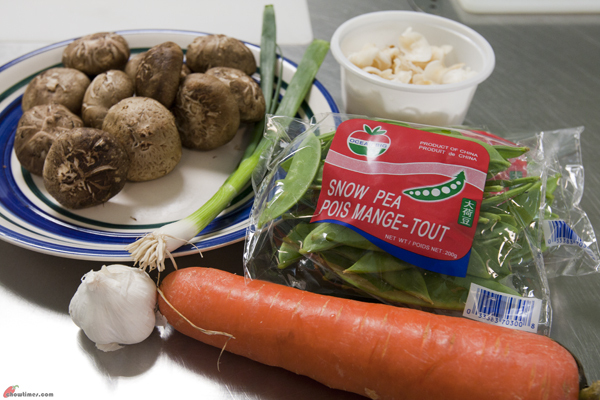 The fresh vegetables retain the vitamins due to no cooking is involved. Heat is the main culprit to destroy vitamins. The only vegetables that need cooking is potatoes. Of course, there is meat in this dish which needs cooking. You can add poached chicken, fish, ham or sausages to this dish. Okroshka is usually made with cucumbers, carrot, a garden radish, parsley, baby dill, green onion, eggs, lemon juice, butter milk or sour cream or mayonnaise. If you like to add meat, it has to be cooked and chilled. The ratio of meat and vegetables should be approximately half and half. Iryna, thank you for sharing your favourite soup with us. Iryna shared with us something about her country, Ukraine. Ukraine is used to be part of Russia. It’s an European country. It is the biggest country in Europe after Russia. It claimed it’s independence in 1921. Ukraine’s population is about 50 million. Ukrainian also speaks Russian and it’s language is similar to Hungarian and Poland. Ukrainian’s winter is very harsh, between -20 to -35 Celsius and the summer can be pretty hot, as high as 40 Celsius. Ukraine has no mountain except the border with Poland and Hungarian. Iryna is from the south of Ukraine which borders the Black Sea. 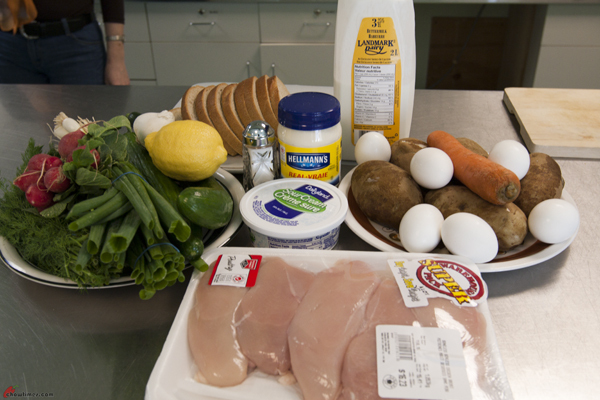 Iryna did not use the butter milk but she used the mayonnaise instead. She brought the butter milk to show us the option. Radish is a root vegetable. It is related to mustard and turnip. 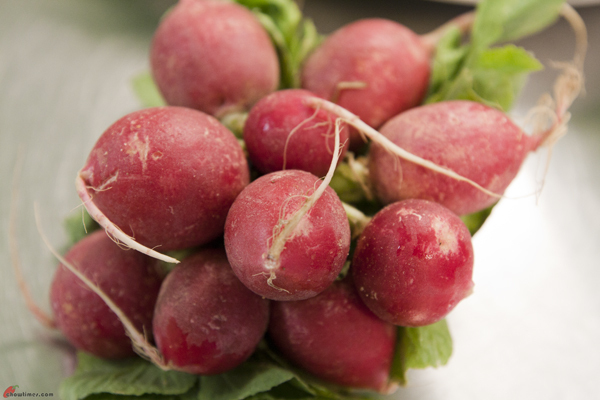 Radishes are rich in ascorbic acid, i.e. Vitamin C, folic acid and potassium. They are a good source of Vitamin B6, riboflavin, magnesium, copper and calcium. Radishes can be eaten raw and is often used in salad. The flavour of Okroshka is predominated by dill. 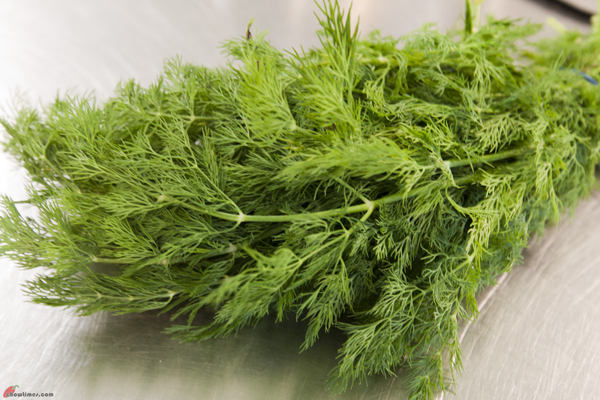 Dill has fernlike leaves that are aromatic and used to flavour many food such as salmon, borscht, okroshka and pickles. Fresh dill loses it’s flavour rapidly if dried, however, freeze-dried dill leaves preserve their flavour relatively well for a few months.